A fairly established theory is that sounds, depending on their character, can be soothing. Ocean waves breaking gently on a sandy shoreline, or the sound of heavy rain on a sturdy rooftop when safe and dry in a warm, soft bed, for example (rather than on a flimsy xe om helmet during rush hour, which evokes a less than soothing array of emotions). And so it follows that sounds can, and frequently are, used for relaxation and healing. 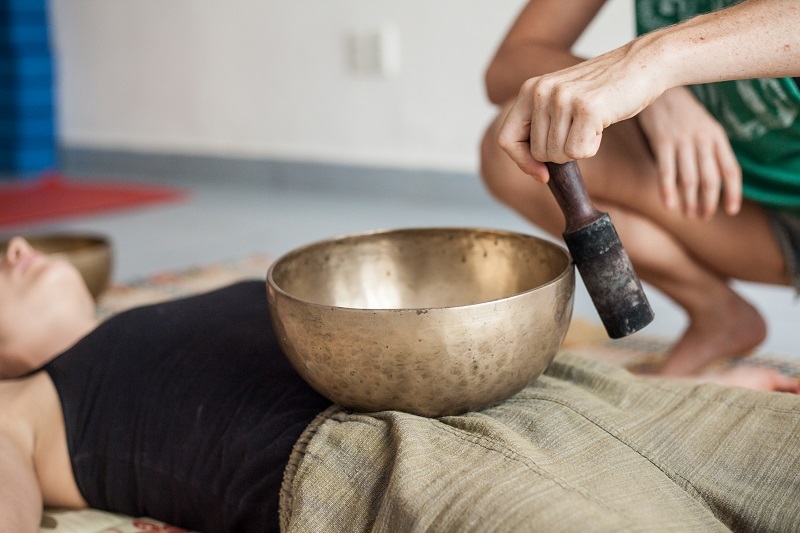 The type of sound healing offered by Rae Dohar from her living room in Thao Dien involves large bowls crafted from seven types of precious metal in the Nepalese Himalayas. 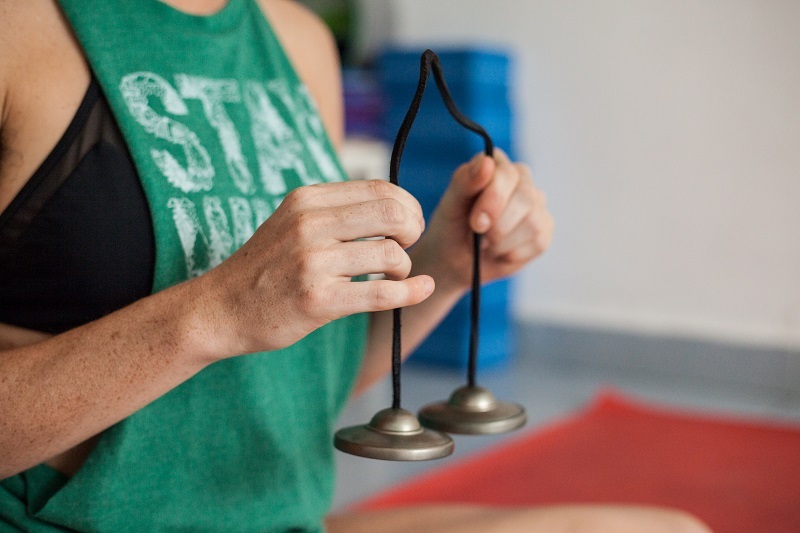 Placing the bowls around the body of her clients, the 31-year-old American yoga teacher, healer and psychic uses a pestle-like instrument crafted of wood and synthetic padding to generate a range of pitches and frequencies that are designed to stimulate chakras—or energy points—within the body. As the name of the therapy suggests, the origin of the practice is Tibet, originally devised by the pre-Buddhist Bon people for use within ceremonies and rituals. The sounds emitted by the bowls are thought to relieve stress-related ailments, with some advocates promising better sleep, an improved memory, mental clarity and increased vitality. This, however, I discovered through a little Google-ing, as Rae herself prefers not to make any firm claims about the therapy, although she does acquiesce that she has had “a lot of success” with sleep disorders. Rae is careful to source the bowls that she uses in her sessions from traditional craftsmen in Nepal and so is confident of their authenticity and material composition. She does not spare any expense in ensuring the quality of her instruments, with each bowl costing something in the vicinity of USD200. “With the cheaper bowls you get a tinnier sound,” she says, adding that while she can’t be sure of how this affects the bowls’ healing properties, she prefers to use the best she can find for her hour-long sessions. Sadly, time constraints meant that my session was shortened to half an hour, during which time we focused on my crown and throat chakras, with a little root chakra thrown in at the end for good measure. Being stereotypically British, I was a little stiff at the beginning and so Rae recommended that I try to be more “zen.” Doing my best to follow her instructions, I assumed Shavasana—or corpse—pose (achievable for even the novice yogi) on a blanket on the floor and visualized gently flowing mountain streams as she placed the bowls around me. The first was sounded by my right ear and generated a not unpleasant low-level hum that did— despite my Britishness—feel instantly soothing. Rae then moved to the alternate bowl where a complementary, higher pitched drone filled my left hemisphere, while a third bowl was struck just below by throat. Once one had stopped ringing Rae returned to restart it, with the order of play seeming to be circular. I discovered later that the intention is to create something like a loop or “double helix” shape of sound around the body. As such each session can last up to 90 minutes, depending on how the bowls are responding to each client. 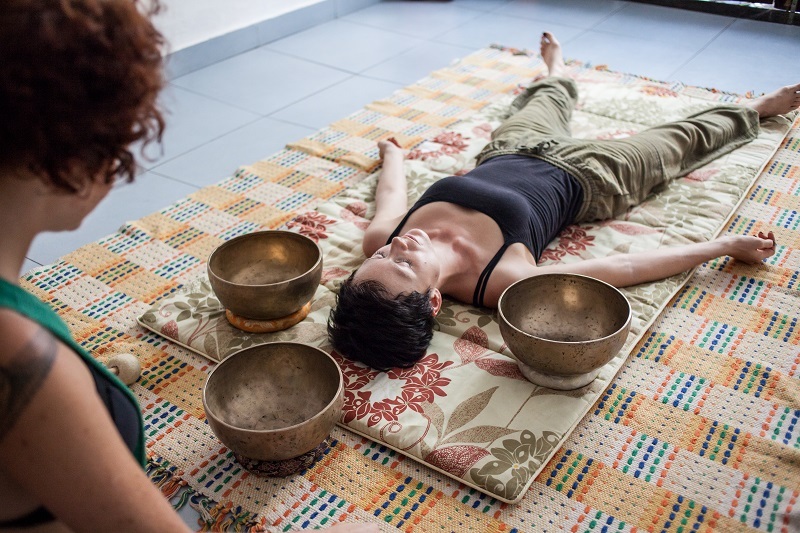 As the pitch of the sounds emanating from the bowls around my head reached their zenith, I started to feel a warm tingling sensation down my right side and, despite my attempts at zen, my concern over an impending seizure grew. However, I was distracted by the final stage of the session, in which Rae placed and struck the final bowl on top of my groin. The vibrations that pulsed out through its base were startling—it felt as if a super-sonic wave were thoroughly examining triplets (incidentally, the therapy is not suitable for pregnant women, or those with cancer). Once the final bowl had ceased ringing we wrapped up and rae and I discussed the session. She said she does not always give feedback on what she has sensed, as not everyone wants to know. I, however, was curious. She confided that she saw in me an ability to “be in rooms with people that [I] disagree with and be diplomatic,” while she could tell from the vibrations around my throat chakra that I was a strong communicator. Finally, she sensed I was a perfectionist—though a very productive one. I commented that these were all rather helpful abilities for a journalist. “Oh yeah! I guess so!” she beamed, as she rolled up the blanket, readying for her next client. Tibeten Sound Healing with Rae Dohar (www.homeyogasaigon.com) is priced at USD55 for a 60- to 90-minute session.